It seems to happen frequently. 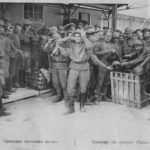 Whether it be a small antique shop, militaria show or even an online auction. 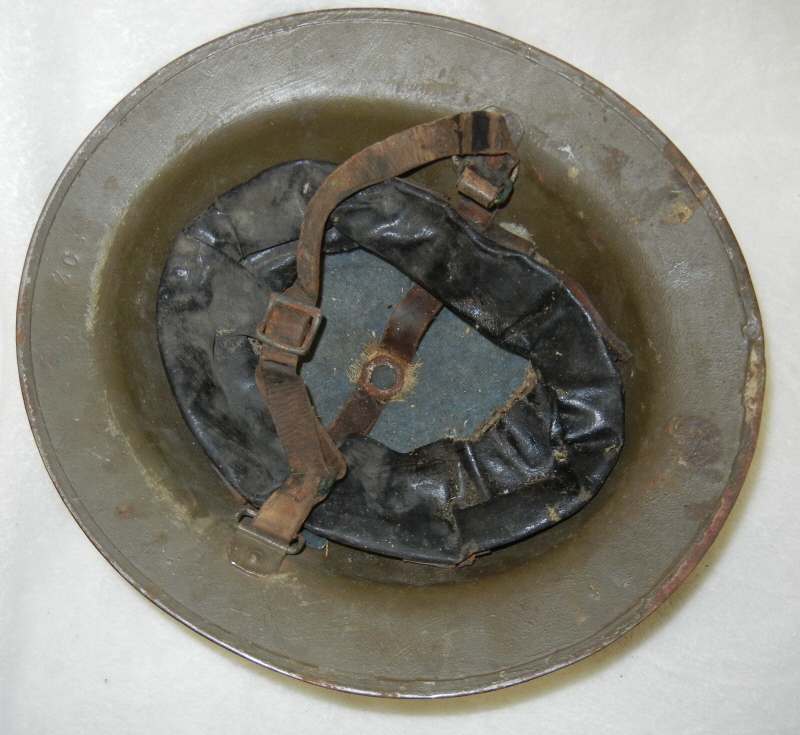 A soup dish style helmet from the Great War, offered for sale is labeled incorrectly. The seller’s description may read, “American WWI helmet” or “British WWI helmet”. Yet more often than not the seller has no idea if the helmet is actually of British or American manufacture, and the buyer has no idea either. It may be tempting for some to say because the two types of helmets look so similar they are the same. This dilemma seems to become particularly problematic for the British reenactors who after spending hundred of dollars on their kit accidentally purchase an American helmet because they don’t know the difference, or for collectors who want one or the other represented in their collection. The truth of the matter is the helmets are different. By knowing about a few small details the buyer will never make the mistake of purchase the wrong helmet. When the helmets are viewed side by side it is easy to see why so many people confuse one for the other. Both helmet have a similar dome and similar skirt. 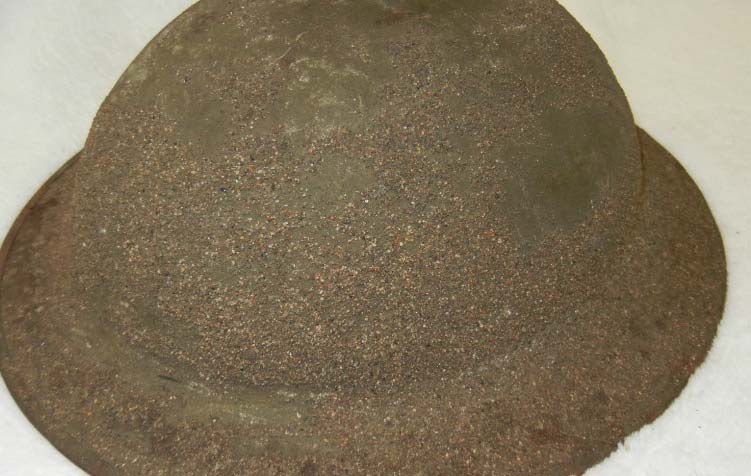 Both helmets are made from hardened manganese steel. Both helmets are non-magnetic. Both were manufactured using a similar process. They also have a similar liner and chinstrap. So is there actually a difference? Although to the untrained eye the helmets may look the same, it in the small details where the differences may be observed. The most obvious difference may be observed by turning the helmet over. 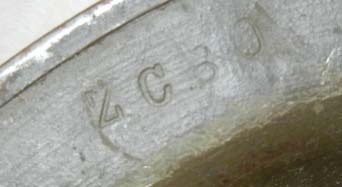 The chinstrap bails on a British Mark I and a U.S. P17 are of a completely different design. The British Mark I chinstrap bails are made from 16 gauge brass or in some cases steel wire. 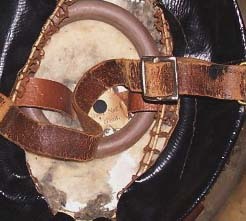 The bail holder is secured to the helmet’s skirt by way of a steel split rivet. The British bail design proved to be too weak for the rigors of the trenches. Many originals show evidence of the bails being replaced. This is due to the split rivet shearing away from strain and the near constant moister of the Western Front. The American P17 chinstrap bail negated the flaws of the British design. The American bail is made from 12 gauge iron wire. It is a much heavier and more robust design. 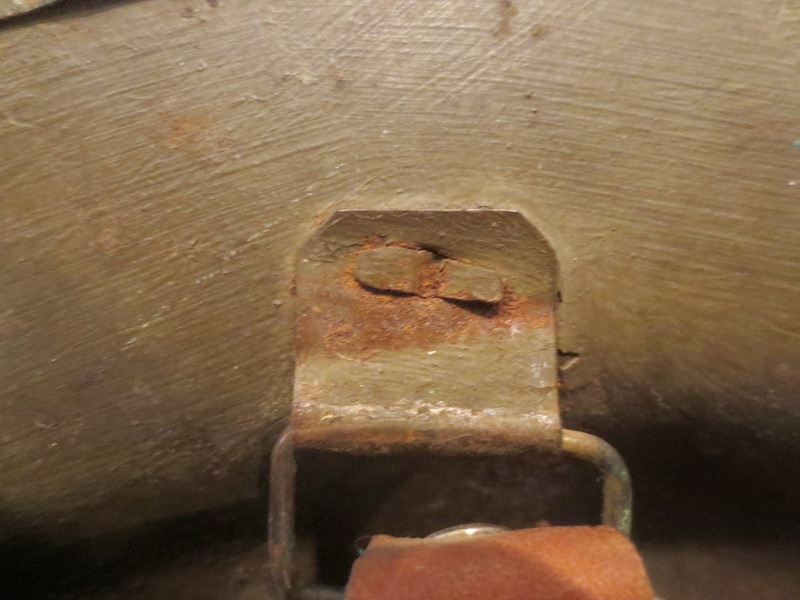 The bail holder is secured to the helmet’s skirt with a steel harness rivet. 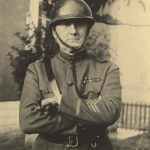 The use of a thicker bail and steel rivet to secure the holder would have minimized the chance of the bail coming lose during combat. This difference along is enough identify the origin of the helmet. 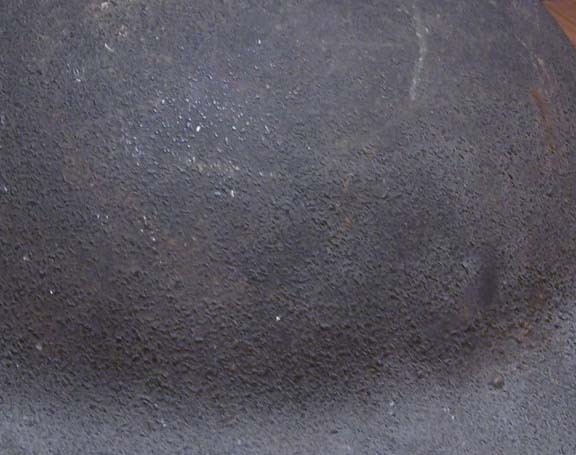 Both the British and American helmet’s have marking stamped into the steel on the underside of the helmet’s skirt. In the case of the British Mark I there is typically a letter followed by a slash followed by another letter. Next to this code there are a series of numbers. The first letters represent the company who pressed the helmet. The letter which follows the slash represents the company who rolled the steel provide for the helmet. There were at least six British helmet manufactures and nine steel suppliers. The series of number which follow the manufacture mark is a heating lot number used by the factory in the manufacturing process. Most American helmets lack manufacture marks. A few have turned up with manufacture marks similar to those found on British shells A number of firms made P17s for the U.S. Military. McCord Radiator, Ford Motor Company were both known to have made P17s, but there were undoubtedly more. It is unknown what is any maker marks these companies used. Most American helmet do have heating lot numbers. The code usually starts with a Z and is followed by a series of numbers. The Both the liners and the chinstrap on the British and it’s American cousin are almost identical. There are some small differences though, one being British chinstrap have stamped steel or brass slide buckles while the Americans favored cast steel slide buckles. The British did have an upgrade that was never adopted by the Americans. 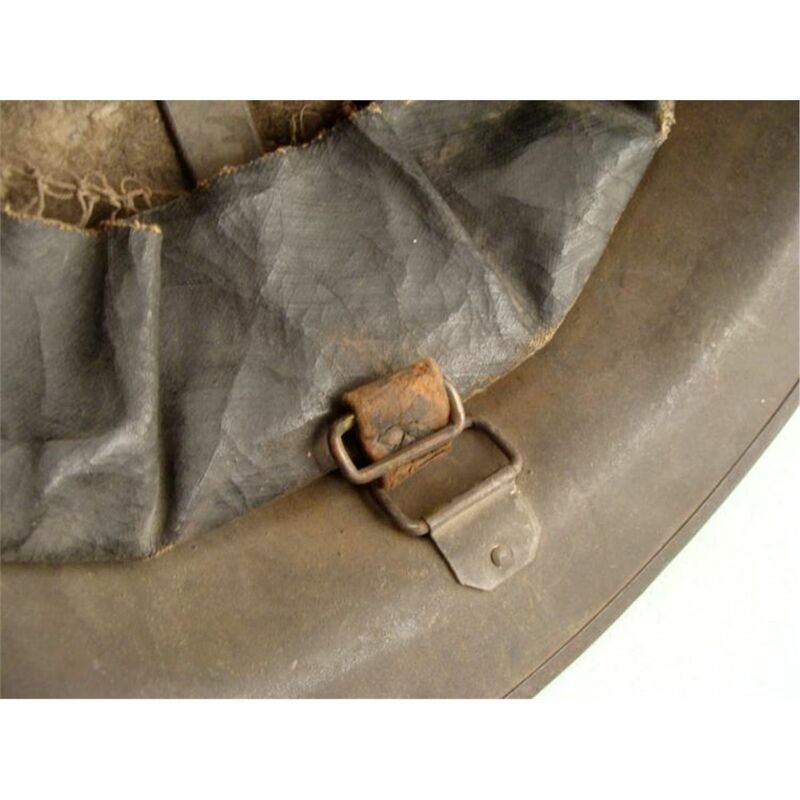 The British Mark I has a rubber ring sometimes called a doughnut sewn between two pieces of wool in the base of the helmet dome. The doughnut was added for the wearers comfort. 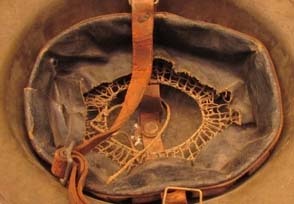 The British Mark I has a rubber ring sometimes called a doughnut sewn between two pieces of wool in the base of the helmet dome. The doughnut was added for the wearers comfort. It was undoubtedly a welcome relief from having the helmet constantly bounce up and down on the top of the wearer skull while running across no man’s land. Early Mark I helmet initially had this feature only to be discontinue in mid 1916. The ring didn’t stay gone long and was brought back in 1917 no doubt to the joy of the average Tommy. Although the helmet shells do look the same they do not feel the same. By holding a British shell in one hand and an American shell in the other the weight difference is obvious. The American shell is heavier. 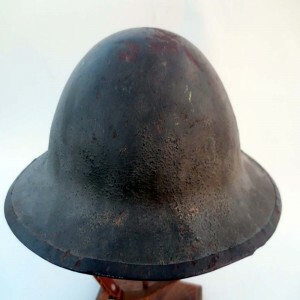 The British helmet is made from 21 gauge steel, while the American helmet is made from 19 gauge steel. The color of paint used by both the British and American manufactures do show some similarity. 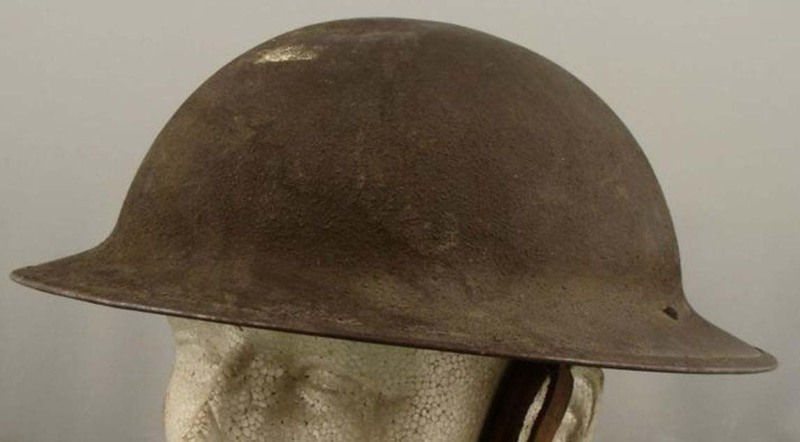 Some American helmets tend to be a darker olive color, while others have paint identical to their British counter parts. While British and American helmets may be painted similar colors the finishes on the two type of helmet differ. British helmets were brush painted by hand. A quick examination of an original example and the brush strokes can easily be seen. To avoid a smooth reflective finish a small amount of river gravel was mixed into the paint. The American manufactures used an entirely different method to apply the paint to the helmets. The unpainted shell was dipped onto a vat of olive paint. While the paint was still wet it was dusted with a coat of saw dust. 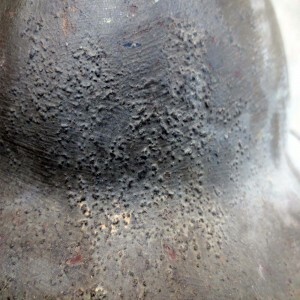 The helmet was then heat cured creating a hard durable textured finish. The high temperature of the oven caused the lead based paint to melt briefly before hardening which encapsulated the saw dust particles securing them to the helmet’s surface. 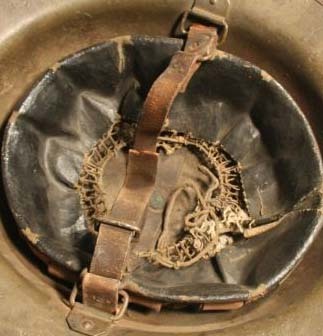 Helmets such as this did not leave the factory this way. These heavy finishes were field or depot applied. The constant handling a helmet would receive in the field would compress the saw dust finish. Over time this would nullify any anti-reflective properties the finish possessed thus putting the wearing in danger. 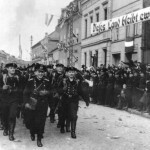 The British cleverly dealt with this problem by issuing their men with a Hessian cloth cover. The cover was made from the same type of cloth the sand bags the held up the trench wall were made of. This cloth by it very nature blended in well and covered up any shiny paint on the helmet’s finish. 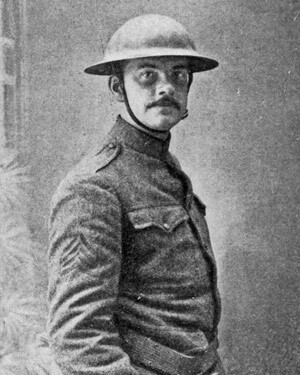 Although a few American troops did manage to get a hold of covers by in large the A.E.F. never received helmet covers while in France. Depots simply would repaint helmets where the paint had lost it’s anti-reflective properties with an extremely heavy gravel finish. This is a photo of the inside of a heavy gravel textured P17. Brush strokes can clearly be seen on the inside of this helmet’s skirt, while the helmet’s dome maintains its original factory paint. 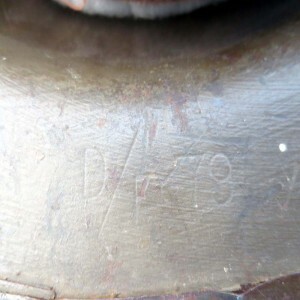 Indicating that at some point the helmet was repainted in the field or by a supply depot. 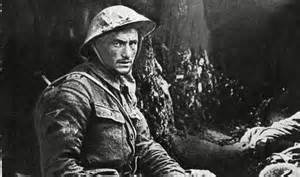 It it worth noting that while British servicemen were never issued with American helmets, American service men were issued British helmets. The A.E.F. 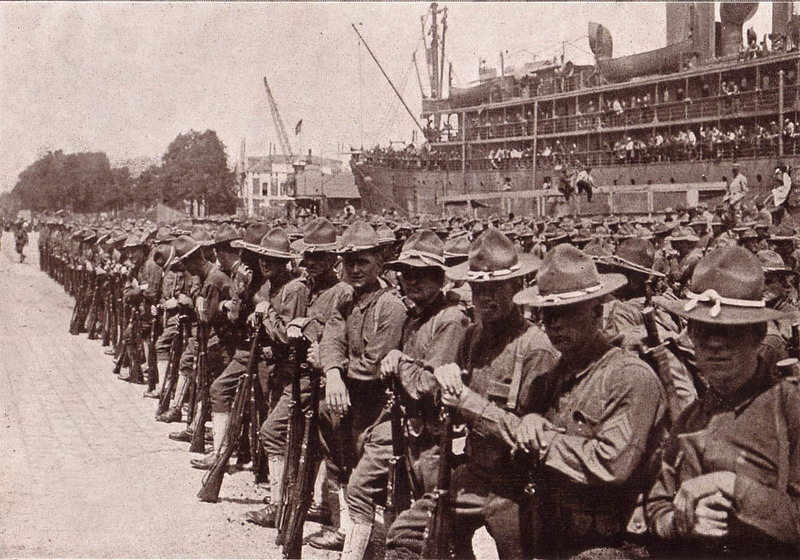 arrived in France in 1917 wearing wool campaign hats, which would have been unsuitable for trench combat. 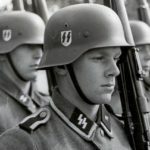 Helmets were procured from British supply until such point as the Americans could supply themselves with their own helmets. 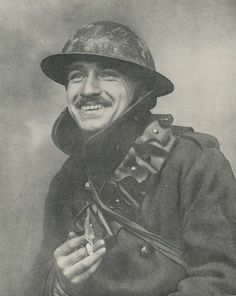 So a large number of American dough boys wore British made helmets though out their service in France. 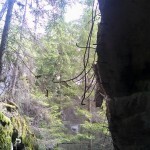 shyomegawolf - March 31, 2019 at 5:57 am - Permalink - Log in to reply. I have a World War One British mark 1 hemelt shell and I was wondering if there is a way to find out was the company that made the helmet by the stamp mark FS 164. And the river gravel is nearly all on the skirt, why is that? Jacob - April 4, 2019 at 2:25 am - Permalink - Log in to reply.